With increasing urban density, skyscraper construction is on the rise. In 2014 alone, 97 skyscrapers were built worldwide, a record for a one-year period (1). In this context, some urban planners and preservationists portray tall buildings as environmentally harmful (2), concentrating on how unsustainable design features create an ‘urban evil’ which is detrimental to the environment. Skyscrapers have gained a reputation for excessive water use, energy consumption and CO2 emissions. In this context, many have concentrated on the potential of new-build ‘green-skyscrapers’ (3). However, concentrating on new building design fails to consider retrofitting existing constructions and overlooks human use of buildings. It also neglects how skyscrapers relate to the wider geography of the city (4), by condensing urban environments and influencing transport choices, as a means towards achieving urban sustainability. To understand the potential environmental benefits from contemporary design, the ways skyscrapers may be harmful must be considered. With Otis’ development of the safety brake in 1854, the elevator age began (5). Early skyscrapers were dominated by desire to reach new heights, rather than any environmental concern, ensuring that high-rise buildings now consume 16% of energy worldwide (6). When compounded by increased exterior exposure to wind and sun, poor insulation of early skyscrapers results in higher heat gain and loss, ensuring that they need constant heating in colder months and cooling during summer. Heating, ventilation and air conditioning account for an estimated 75%+ of energy consumed by high-rise buildings (7), with 30-50% of transmission losses through windows, even though their contribution to the overall surface area is much less (8). With rising energy costs and awareness of the finite nature of resources, insulation problems allow anti-skyscraper advocates to tarnish tall buildings as environmentally harmful. However, as Appel recognises, ‘you take the same amount of energy to heat a space and cool a space whether it’s 900 feet up in the air or ten feet up in the air’ (9). Thus, insulation problems are not limited to skyscrapers. Moreover, due to their height, skyscrapers entail intrinsic design features which can harm the environment, as more energy is needed to provide electricity and water to upper floors, and to allowing occupants to access higher floors. As buildings become taller, elevators become faster and bigger, increasing energy consumption. However, elevator energy use is recognised, and contemporary innovations can now minimise their consumption to as little as 5% of energy consumed by the whole building. Consequently, sustainable design offers potential to mitigate the environmental impact of skyscrapers. Other contemporary design allows skyscrapers to have minimum negative environmental externalities. Green design and clean technology solutions have led to ‘eco skyscrapers’ (10). For example, the needle-shaped Okhta tower, St. Petersburg, allows sunlight to penetrate the building, using natural light to ensure comfortable temperatures without needing artificial heating (11). Additionally, skyscrapers need not only consume energy. For example, Bahrain’s World Trade Center holds three 96-foot wide wind turbine blades between the towers, producing 1300 MWh per year (12). The proposed Lighthouse Tower in Dubai will feature 4000 south-facing solar panels and three 225 kilowatt wind turbines, reducing energy needs of the building by 65% (13). However, these new designs have been questioned. For example, 30 St. Mary Axe ‘The Gherkin’, is portrayed as ‘London’s first environmental skyscraper’ (14) as its shape maximises natural lighting, reducing need for artificial light. However, its glass façade is accused of creating intense light glare, raising surrounding air temperature and affecting neighbouring buildings (15). Concentrating on constructing green skyscrapers ignores how they affect other buildings. For example, skyscrapers can shade nearby buildings (16), thereby increasing their need for artificial light and reducing their potential solar energy generation. Consequently, blanket claims for the sustainability of innovative design features are inappropriate, implying that there may be value in considering the other ways in which skyscrapers relate to the environment. Furthermore, new constructions fail to consider feasibility. In dense cities, the practical capacity to construct new eco-towers is limited by ever-reducing amounts of land. New eco-scrapers would ensure high-performance developments, whilst allowing inefficient buildings to continue to pollute the environment. Consequently, creating more energy efficient cities may benefit from retrofitting existing skyscrapers. Firstly, skyscrapers can be retrofitted with on-site renewable energy generation. 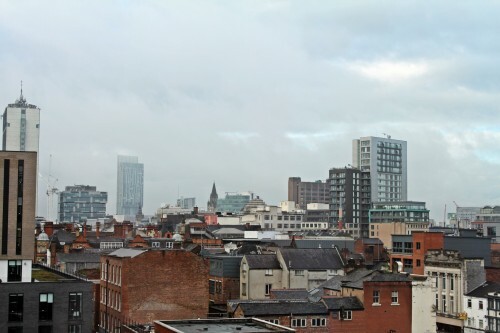 For example, in 2005, Manchester’s CIS Tower was retrofitted with 7,000 solar panels and 24 wind turbines, allowing the tower to supply 10% of its energy needs. Secondly, responding to concerns about poorly insulated skyscrapers, retrofitting can reduce energy consumption needed for heating and cooling. This includes small-scale, incremental adjustments, such as replacing single-pane windows with double-panes and weather stripping windows to seal the interior from heat escape. In 2009, all 6,514 windows of the Empire State Building were refurbished, insulation was installed behind radiators and a low emissivity film and gas mixture was placed between the re-used panes (17, 18), reducing energy use by 38%. Third, elevators can be retrofitted to reduce energy use. Continuing with the Empire State Building, all 68 elevators became 30% more efficient by reducing the waste heat of machinery and channelling waste energy back into the electrical system (19). Retrofitting existing skyscrapers is promising given the quantity of existing stock. Indeed, it is proposed that it would take 10-80 years for a building 30% more efficient than an average-performing building to overcome the environmental impact of construction (20), implying that it is more beneficial to revisit existing buildings than to construct eco-skyscrapers. Considering technical adjustments ignores how users respond to energy-saving features. Constructing, or adjusting existing buildings to be environmentally-friendly alone is insufficient if those interacting with the building do not adopt an environmentally-friendly mindset. Indeed, it is claimed that in large residential or office complexes, user behaviour and its consequences are often disconnected (21). This is because those using energy do not pay for what they use, so have no financial incentive to reduce energy use. Thus, if climate change is anthropogenic, assessment of the environmental impact of building design is incomplete without considering the human use of these features. Sustainable design will not inevitably trickle-down to occupants; there is need to create environmental awareness at the point of use. To understand the environmental impact of buildings, planners need to move beyond the mid-20th century modernist approach to urban design to thoroughly consider how buildings are engaged. Alternatively, skyscrapers may be beneficial in the compactness they enable. Firstly, skyscrapers increase urban density. Glaeser (22) proposes that cities should build upwards in already dense areas to reduce the need to build outwards. Glaeser claims that ‘living in a concrete jungle is actually far more environmentally friendly’ (23). Documenting a carbon inventory of housing in America, he claims that ‘the average household living in a census tract with more than ten thousand people per square mile uses 687 gallons of gas per year, while the average household… in an area with fewer than one thousand people per square mile… uses 1,164 gallons of gas per year’ (24). Even if cities produce a large proportion of national carbon emissions, reduced commuting levels suggests that living in cities may be greener than living in ‘green’ suburbs. Secondly, compactness means that journeys can be combined. ‘Lunch hours and journeys to and from work can be used for errands, such as shopping… so people maximise the efficiencies of their journeys’ (25), rather than making repeat trips. This demonstrates that building on a concentrated scale not only removes the need for daily commutes from suburbs but offers possibility to reduce intra-urban travel by situating workplaces near utilities. Further, compact cities allow space to be preserved elsewhere, so that surrounding natural areas can continue to provide habitats for plants and animals and remain as protected environmental areas. Not only does preserving open space reduce potential competition from developers, open space also protects water resources by filtering pollutants and debris from entering the water system. Therefore, considering the skyscraper at the scale of the building itself naïvely overlooks how skyscrapers relate to the wider urban geography. In the context of increasing urbanisation in the global south, predictions that global carbon consumption will increase by 139% if the average person in India and China created the same carbon emissions as the average American (26), imply that reducing carbon emissions in daily activity is essential. Growth is predicted to be concentrated in cities, with urban areas set to expand by over 1.2 million km² between 2012-2030 (27). It is vital to determine how energy use can be reduced in cities. As such, determining the environmental impact of urban infrastructure is of great urgency to mitigate human impact. Urban areas, by condensing lifestyles and reducing the need to commute, have great potential to reduce energy use. Fortunately, urban planners have begun to recognise that merely building green is insufficient, as ‘a very green tower that’s car-orientated isn’t really green’ (28). By reflecting on infrastructure, policymakers have a prime opportunity to ensure that rapid urbanisation need not guarantee environmental harm. In doing so, considering the environmental prospect of tall buildings must shift from narrow considerations of small-scale design features to how skyscrapers interact with the wider urban space. (1) CBC News (2015) ‘Skyscraper construction total hits record in 2014’, http://www.cbc.ca/news/business/skyscraper-construction-total-hits-record-in-2014-1.2899340. (2) Mehaffy, M. (2011) ‘More low-down on tall buildings’, Better Cities [blog] http://bettercities.net/news-opinion/blogs/michael-mehaffy/14138/more-low-down-tall-buildings. (3) Barrera, V.T. (2009) ‘Ten of the Greenest Skyscrapers in the World’, Energy Trends Insider, http://www.energytrendsinsider.com/2009/05/12/ten-of-the-greenest-skyscrapers-in-the-world/. (4) McNeill, D. (2005) ‘Skyscraper geography’, Progress in Human Geography 29 (1), p41-55. (5) Glaeser, E. (2011) Triumph of the City: How Our Greatest Invention Makes Us Richer, Smarter, Greener, Healthier, and Happier (Penguin Books). (7) Wener, R. and Carmalt, H. (2006) ‘Environmental psychology and sustainability in high-rise structures’, Technology in Society (28), p158. (8) Gustavsen, A., Grynning, S., Arasteh, D., Jelle, B. P., & Goudey, H. (2011) ‘Key elements of and material performance targets for highly insulating window frames’, Energy and Buildings, 43(10), 2583-2594. (10) Yeang, K. and Richards, I. (2007) Eco Skyscrapers 1 (Victoria, Australia: Images Publishing Group). (19) Al-Kodmany, K. (2014) ‘Green Retrofitting Skyscrapers: A Review’, Buildings, 4(4), 683-710. (21) Wener, R. and Carmalt, H.
(25) Al-Kodmany, K., & Ali, M. M. (2013) The Future of the City: Tall Buildings and Urban Design, (WIT Press), p38. (27) Seto, K.C., Guneralp, B. and Hutyra, L.R. (2012) ‘Global forecasts of urban expansion to 2030 and direct impacts on biodiversity and carbon pools’, Proceedings of the National Academy of Sciences (109:40). (28) Halbur, T., Negrette, V., Fortin, K. and Jamawat, J.